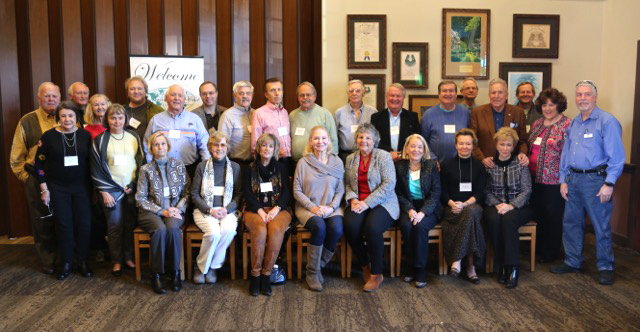 The Texas & Oklahoma TCC Chapter kicked off the new year with a festive gathering in Houston. Thirty members and guests attended The Texas & Oklahoma Chapter’s 1Q 2018 luncheon meeting on January 13 at Beck’s Prime Restaurant in Houston’s Memorial Park. Our featured speaker was fellow TX/OK chapter member Scott Gaille (energy lawyer, university faculty member, and author of textbooks and novels), who presented the topic “Strangest Tales Around the World.” Scott and his wife Gina are working, together with Don George of Lonely Planet, on a project to capture and document in a book the tales of local experience and lore as told to them by people of various civilizations around the world. He explained that with today’s internet, cell phones, television and efficient travel, the civilizations of the world are blending and becoming more homogeneous. And many of the characteristics and differences of their heritage, including stories and tales unique to each one are disappearing. As they travel, especially to remote villages, they talk with local people, sometimes children in schools, and also people who they simply encounter and who are willing to talk a while. Scott has found that a great way to elicit the telling of stories is to ask the question “What’s the strangest thing you’ve ever seen?” Scott told several fascinating examples they have documented like the career aspirations of school children at a Masai village in Tanzania, the story of the first lawyer from a Hmong village in northern Laos, how Crucifixion Beach in Togo got its name, the spontaneous discovery of an effective “shark repellant” in Bora Bora, and the Wall of Humanity on an island in Lake Titicaca. We also held a 2-minute per person around the room travel story-tell, of whatever nature the person wished. All the stories were interesting and enthusiastically told from the cherished travel memories of each person. Jordan Hargrave provided, and told the stories behind, an “On Display” of three musical instruments he as brought home from his travels — a valiha from Madagascar, a kora from west Africa, and a morin khuur from Mongolia. The next quarterly meeting of the TX/OK Chapter will be held April 14 in the San Antonio area. The venue and details will be announced in due course. If members of other chapters would like to attend, just contact Paul Clites (tel. 281-732-7202, email tcctxok@gmail.com) so we can welcome y’all.